An Israeli ambulance driver who tried to help an Arab woman in Jerusalem Sunday found that his kindness was repaid with stones. An Israeli ambulance driver who tried to help an Arab woman in an eastern Jerusalem neighborhood Sunday found that his kindness was repaid with rocks, as local Arabs showered him and his ambulance with stones and bricks. The driver, who spoke to Arutz Sheva, chose to remain anonymous, but he had plenty to say about the ingratitude of the Arabs he encountered. "We were called to help a Palestinian woman who had suffered a heart attack near the Judea and Samaria police station," the driver said. 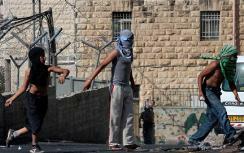 "We arrived about the same time as Arabs were throwing rocks in the Old City on Sunday morning. While we were treating the woman, we hit by a hail of stones, and we thus found ourselves on the one hand trying to revive the Palestinian woman, and on the other hand being protected by Border Police from the rocks being thrown at us," he said. The driver said that a cameraman from the pan-Arab network Al-Jazeera observed what was going on. When the driver asked the cameraman to record how the Israeli team had treated the Arab woman – and how the local Arabs had treated the Israeli rescue workers – the cameraman packed up his gear and drove away in his vehicle. The driver added that Sunday's rock throwing incident was not the first of its kind. "We've been attacked by stone-throwers several times as we drove to help Arabs who needed treatment. We try to provide them with humanitarian treatment, even though we are afraid of getting hit by rocks," the driver said. "We always have a hard time understanding how they can be so ungrateful," he added.